We make our own “luck”. It would be nice if all we had to do was sit back and wish for the good things in life, stand around and hope our situation will get better. 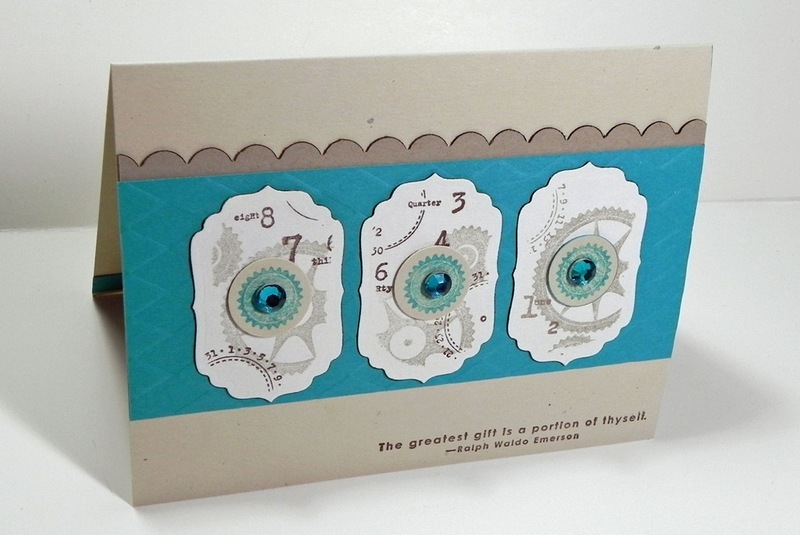 I’d like to share a card I just made from a fabulous collection of papers and a really nice set of stamps. I used the latest sketch from Freshly made Sketches. Quite a lovely and elegantly simple one really. 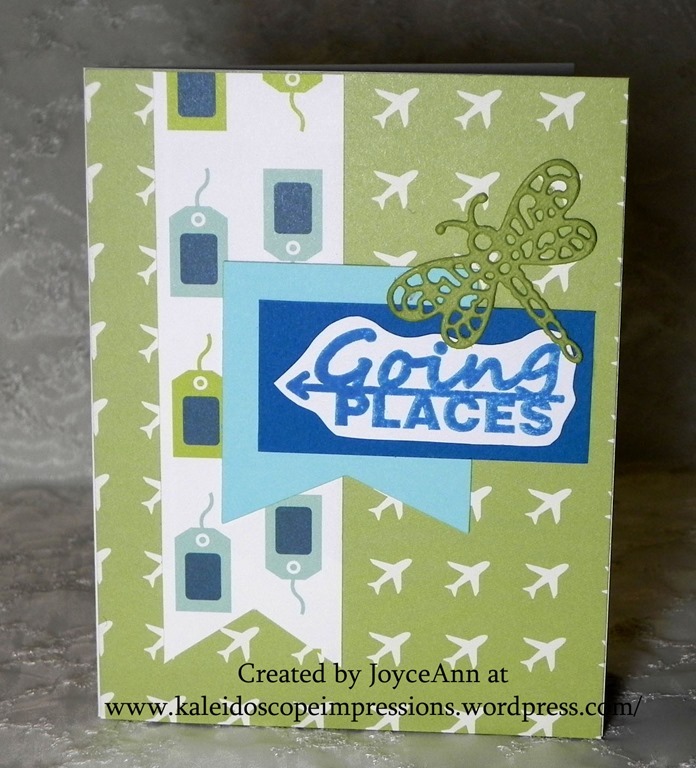 So keeping with a masculine theme from the Journey Coach challenge I selected papers from the Fun Stampers Journey “Going Places Prints” pack. Favorite colors for me! The sentiment is perfectly matched to the papers with this stamp I chose from the “Travel Time” stamp set. Even if I say so myself. I faced the card with the green planes, added a strip of the tags print for the banner, cut a solid “Pool Play” with the “Banner Parade” dies. I stamped the sentiment on some scrap white, (would have had a nicer image if I had used the good FSJ white), cut around it and pasted it on some solid “Catalina Splash” (a HUGE favorite) before adhering to the card. Its been a few years, two or three at least, that I was at a scrap show and picked up these dragonfly dies. Finally used one. It is by Tessler Crafts. If you are still with me, you may be wondering why I opened with the statement about luck. Well, here it is, I now have a card idea (and ideas for more) to send to friends who need encouragement or congratulations when struggles or achievements strike. We make our luck by taking action on our dreams! Isn’t that paisley pumpkin the cutest?! I know the circles of cs are SU! I just don’t remember for sure the names. Su! cs is still the best, as is their ribbons! Now, the card on the right was made by stamping the trees from an older set, Trees Three, that I’ve had for a while. 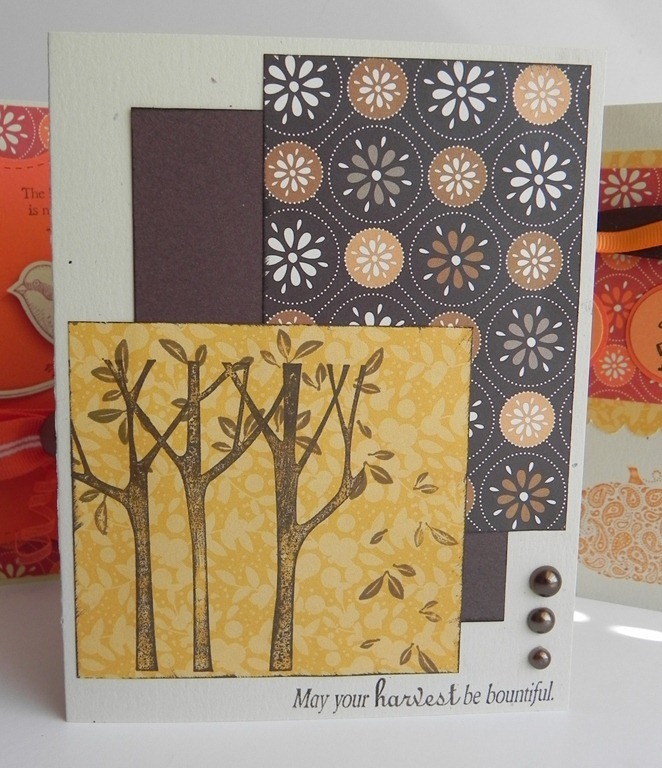 This Clean and Simple Fall card is for the challenge PSC55 at Perfect Sentiments. Stamped trees in chocolate chip, leaves in soft suede on the yellow patterned DCWV paper. The sentiment is from Mark’s Finest Papers in chocolate chip on the sand card. I have a backing of chocolate chip cs behind the two DCWV patterned pieces. I added the Prima pearls for my final touch on this basic and simple card. What I had originally planned for this third card didn’t survive. Today I changed it up by adding the bird and different sentiment than what I started out with. Although I moved away from the fall theme I love where this ended up. Everything is Stampin’ Up! except for the sand card and patterned background. Oh, and the button is from BoBunny. Using Cricut I’ve created another “Key to my heart” card for Operation Write Home request for Love cards. The “forever” is heat embossed. 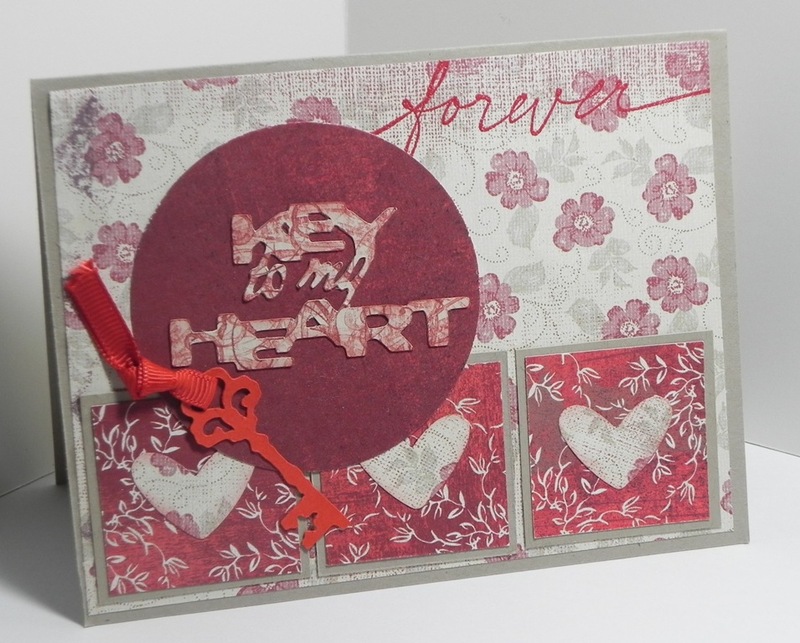 I’ve used punches and for the hearts and circle, the squares are cut from strips of 1 1/2 and 1 5/8 dsp and cs. My package of love cards and hero cards will be in the mail tomorrow. Hoping the package makes it there by the Dec 10th deadline. 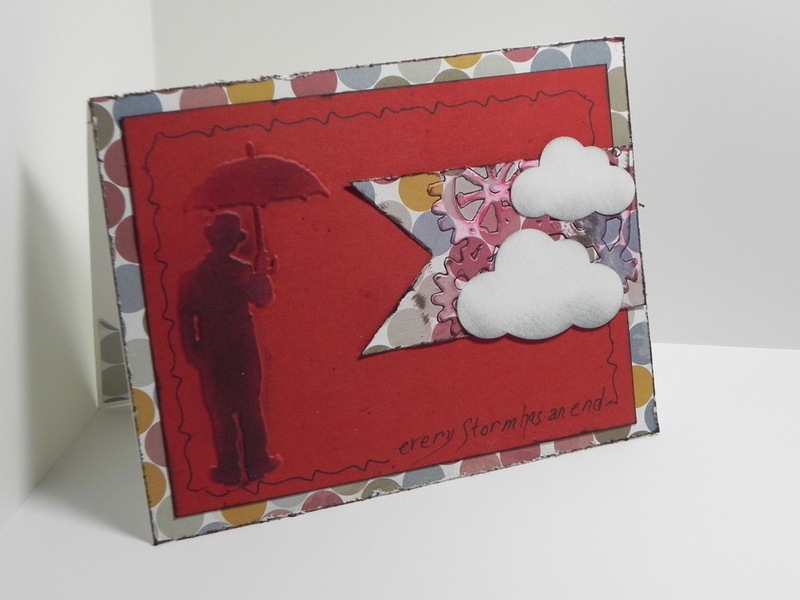 Every storm has an end is what I used with this for my inspired by a song challenge at Charisma Cardz. I found the song on the Internet and it is by Escape the Clouds. 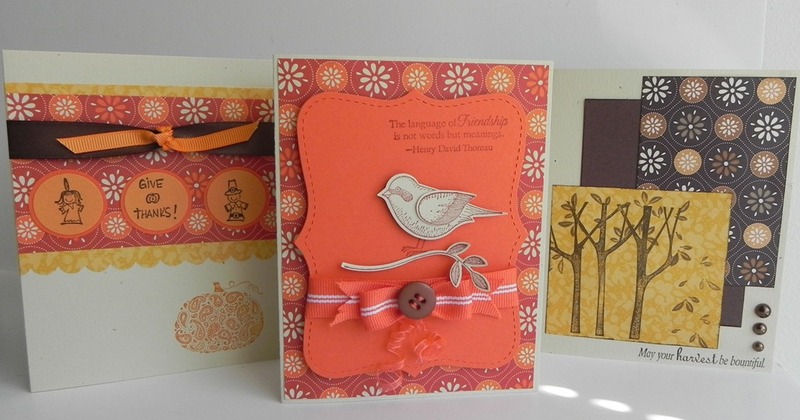 The embossing folders are from Tim Holtz. I inked and rubbed the embossed images, plus I used a Micron pen to outline the gears and to go around the edge after writing the song title – which makes an appropriate sentiment for the steampunk man with the umbrella. The background dotted dsp is retired SU!. I sponged the cloud punches with a metallic rub on the bottom. The sketch is from Operation Write Home blog turned sideways to fit the man. 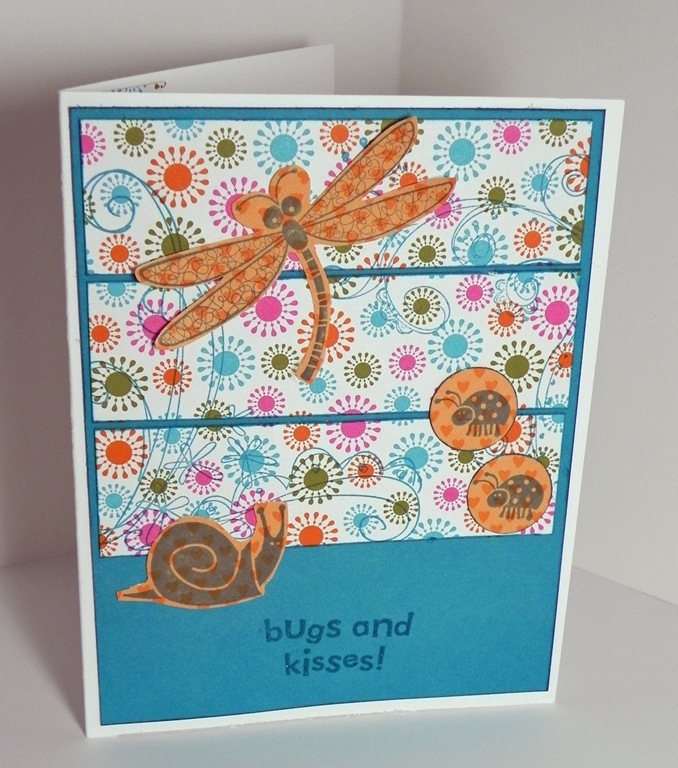 This little buggy card was created from another sketch challenge at Random Acts of Creativity. The bug theme came from the challenge at Shopping Our Stash challenge to use birds, bugs, or beasts and stuff from our stash. This is all Stampin’ Up! stuff from my stash. In fact it has been a long time since I’ve used this stamp set at all. I clear embossed over the sentiment. The bugs are stamped on the reverse side of the DSP I used for the panels. Ok, then, one last night, and one this morning, now off to work! Hope you like them! Have an inky day to all of you. In celebration of this holiday weekend I made these 3 cards for some challenges at the OWH blog. This challenge was to include a moon somewhere on your card. 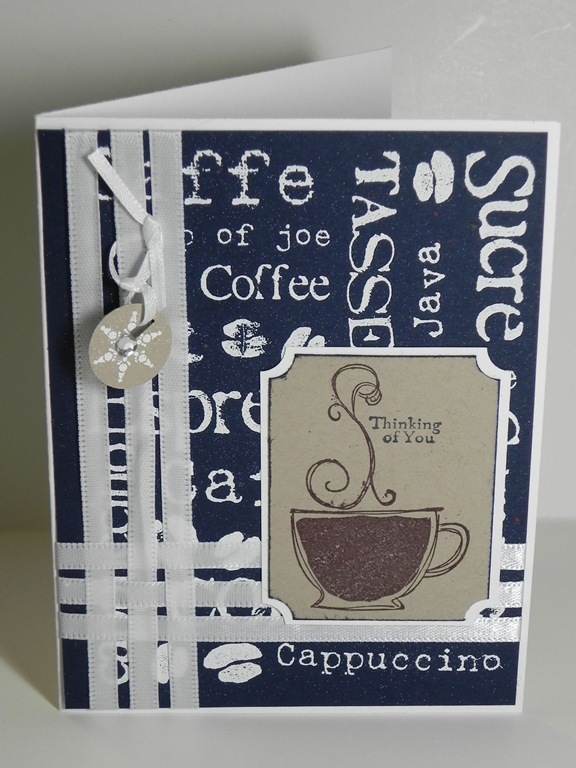 I stamped the trees, pasted on the punched moon and used my Big Shot to run this blue piece through the Stampin’ Up! lattice embossing folder. 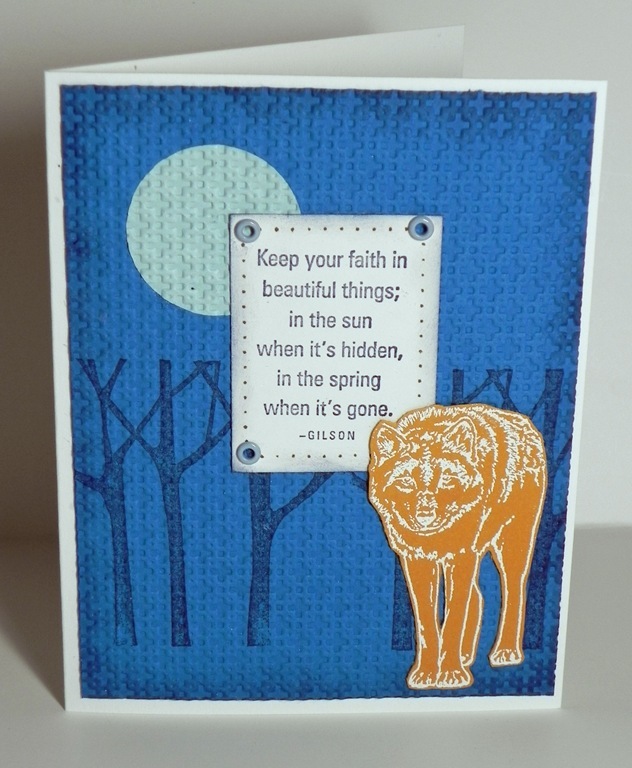 The wolf is made with white embossing powder on More Mustard card stock. On the sentiment piece I added dots with the Soft Suede marker using the tool kit template and added eyelets. 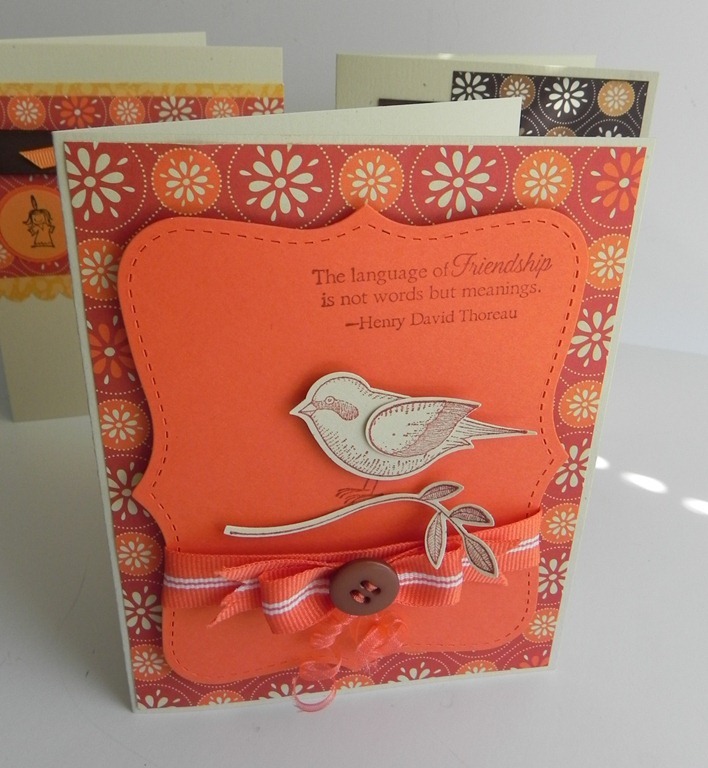 The next challenge I played was to make two cards using the same stamp but with a different look. 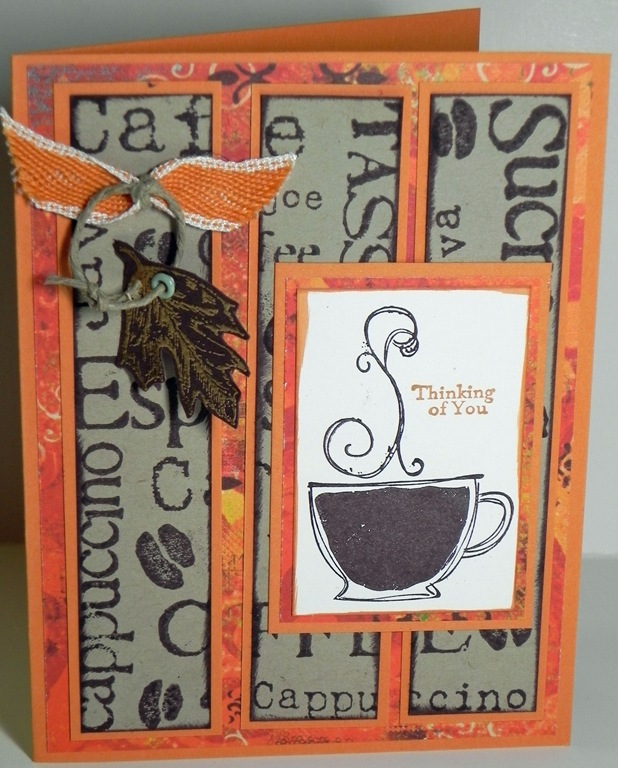 I chose to do a fall and a winter card using the same background stamp and the Stampin’ Up! latte set. For each I added a charm – gold embossed leaf and white embossed snowflake. I kept with a similar idea for each of these two, but hopefully made each for a different season. How are things at your pad? I used a stamp set today that I had never used before. 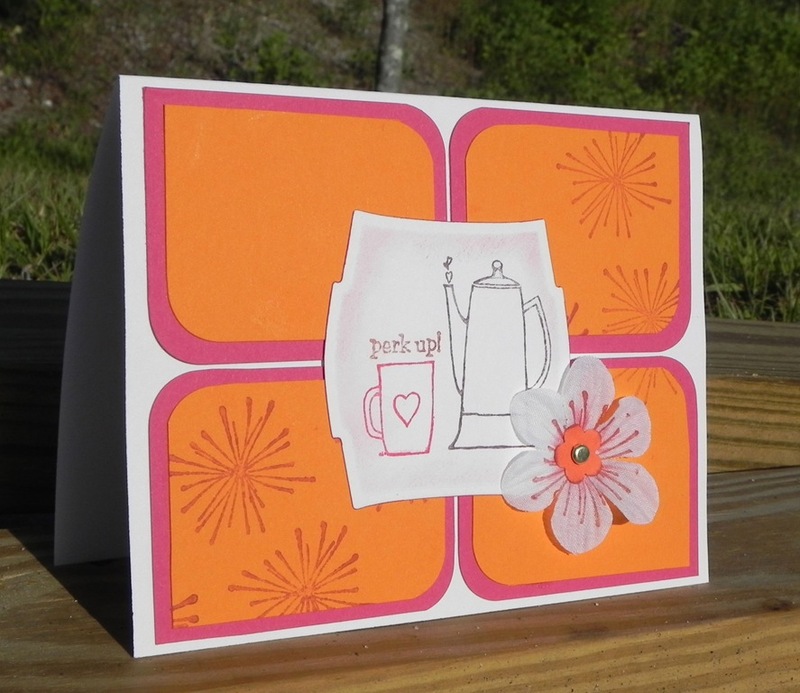 The idea for the coloring comes from Stamping 411 blog. I stamped the image with timber brown Stazon, outlined it with SU markers, and blended the ink with a blender pen. Following the inspiration from two challenges I share this card I made last night, well, actually around 2 or 2:30 this morning. 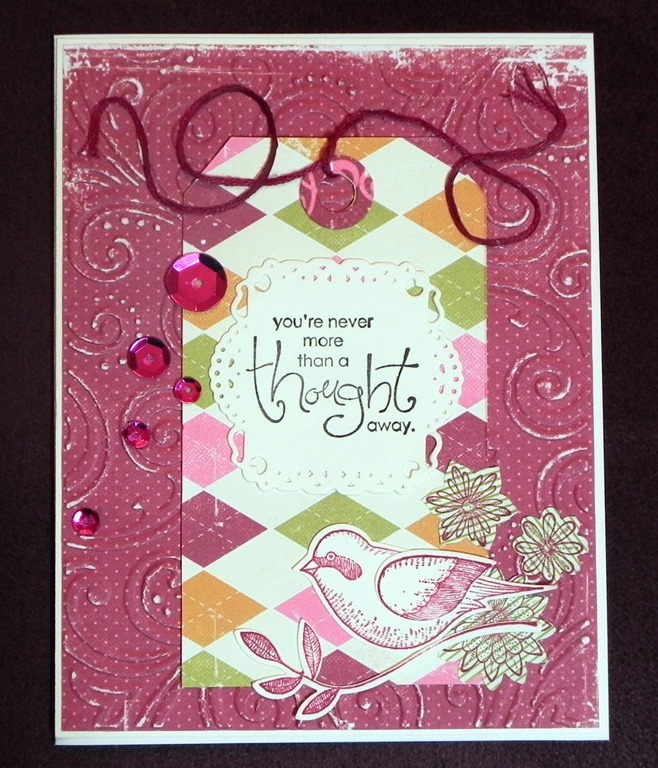 The challenge from Hand Stamped Sentiments is a color Splash challenge to use certainly celery, pretty in pink, and bashful blue. It so said BABY card to me. Then, the challenge from SUO Challenges was in celebration of butterflies. 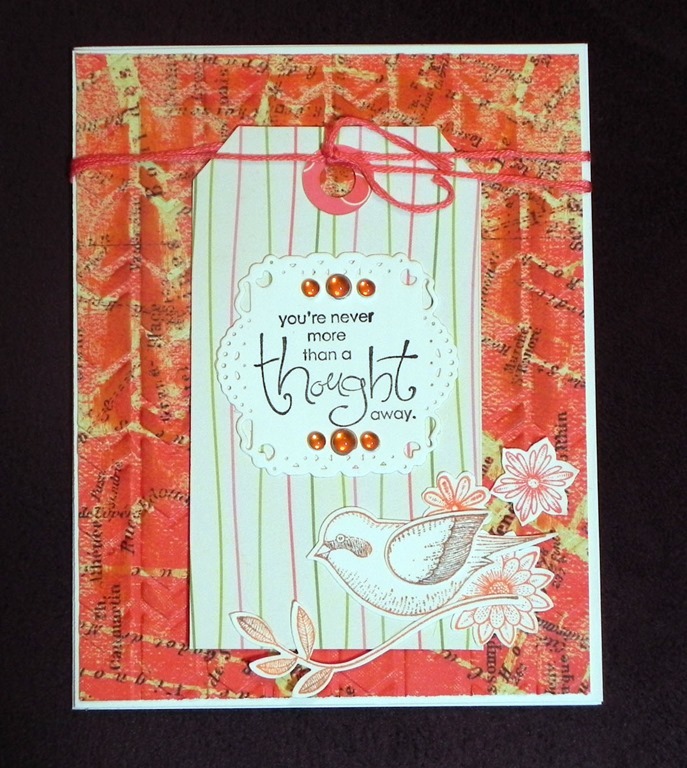 Of course the supplies are Stampin’ Up Only and here is what I did. The crib sentiment is stamped in pretty in pink in lower right corner. The celery cardstock is stamped with the linen background stamp in Versamark and torn to reveal the bottom corner. Blue panel has been run through the Big Shot with the texture plate and punched with the scallop border punch. The trick of the holes in the scallop is to use the piercing tool to eyeball the centers before using the 1/16 handheld punch. A strip of pink was crimped to mat the strip of clear embossed images. Butterflies come from a die cut of DSP. Light distressing was done to go with the torn look. 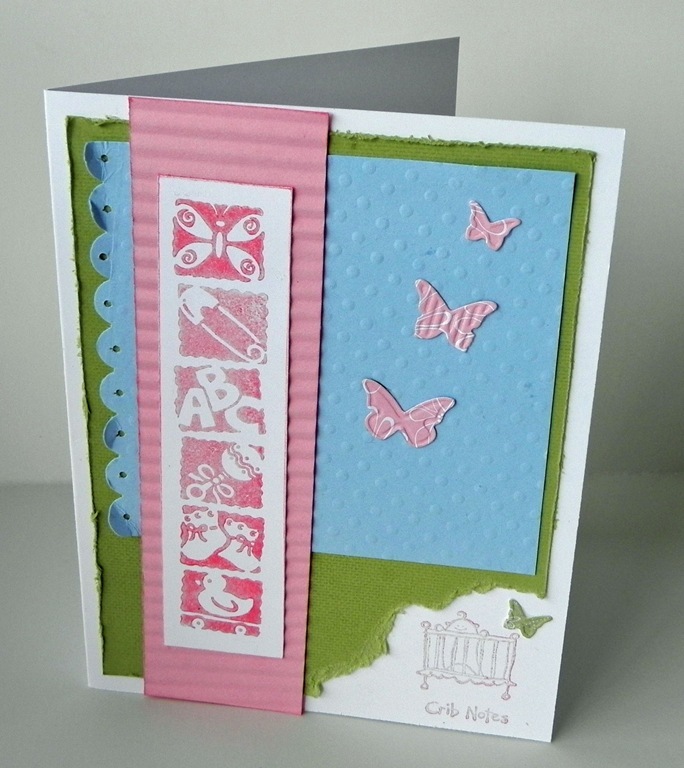 It turned out to be a simple card with no bling, but fits the baby theme with these soft colors. I was going for the more pink side in honor of my great grand daughter who is on her way. This maternity scrub top goes in the mail today to DGD. It is cut from the same pattern I made the first one, and have material to make one more. I figure that since it fit her there is no need to try another pattern, besides this one went together more quickly being familiar with the process. 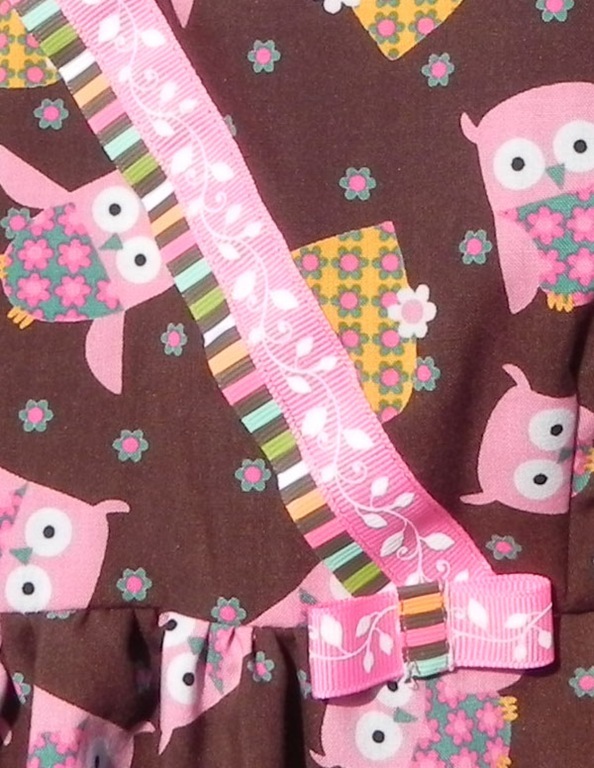 I used a bright pink ribbon with a white vine pattern over a striped ribbon, to tone down the amount of brown. 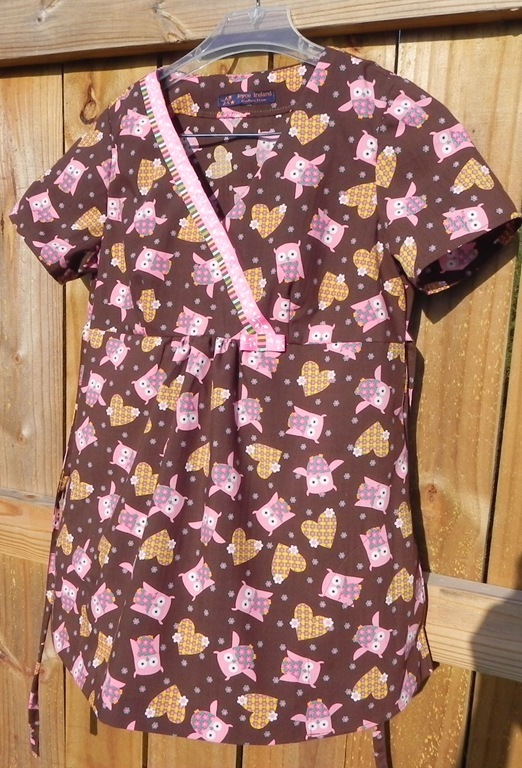 I couldn’t pass up the cute owl fabric even though it has such a brown base and may not be the first choice for a maternity top. It will hopefully be a nice wearing fabric for her – wash and wear with ease. Here are the latest cards from challenges at Splitcoast stampers. One challenge was to use orange and I actually looked up this pumpkin pie color on my SU color wheel and found rose red to be a match. It is also a CASE of a card by Brenda, found here. The SU stamp set is Morning Cup. 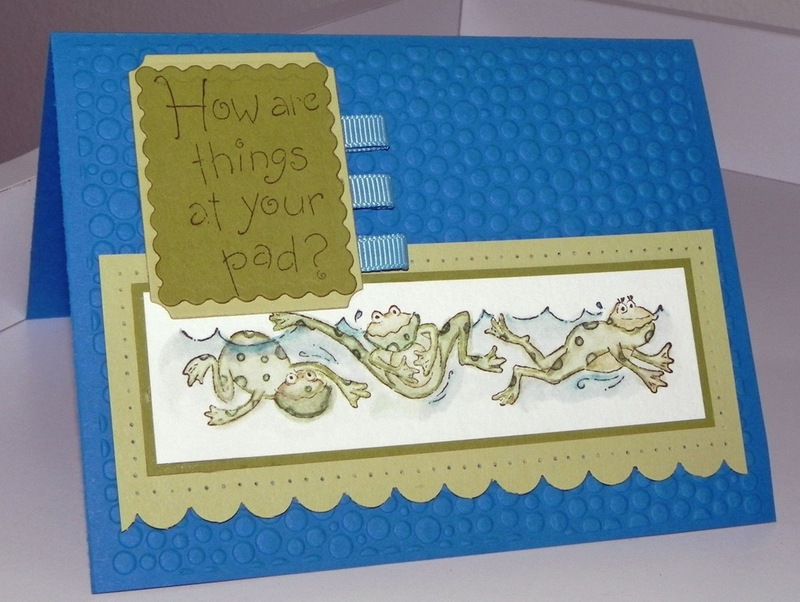 After stamping the three images I cut it out with a Spellbinder die, masked it, and sponged just a bit. The white flower was stamped, a punched out flower and pearl added to the center. This next card was for two challenges as well. One was to keep it clean and simple and to use the artist’s rule of three. And second to stamp within a masked die. I stamped a collage of stamps from the SU set stamp of authenticity in Sahara sand and basic brown. The embellishment on each center is stamped, punched and topped with a rhinestone. The back panel of turquoise is embossed with a plate by SU. 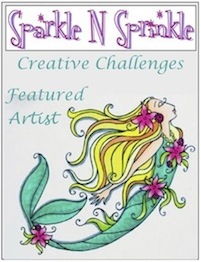 Thanks for stopping by to share my creativity – enjoy your own creativity and share it too! I decided to play in my stamp room today since I have the day off. 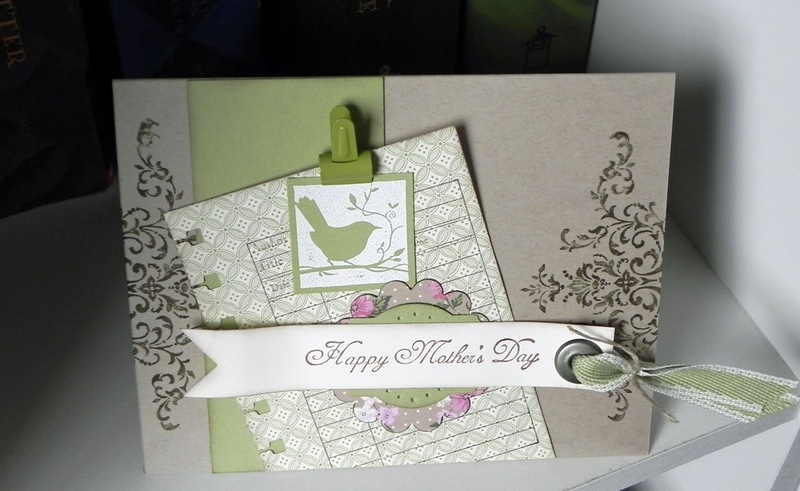 Oh, there are plenty of other projects I should tackle but I was inspired to make this Mother’s Day card with all Stampin’ Up! products for the challenge. Card stock: crumb cake, pear pizzazz, very vanilla. DSP:Springtime vintage. Stamp sets: something to celebrate, Of the earth, stamp of authenticity, bliss. Embellishments: library clip, jumbo eyelet, pear pizzazz ribbon, linen thread. Punches: spiral border, 1 1/4 “ square, 1 3/4 scallop circle, designer label. Ink: basic brown, Sahara sand. Marker: Soft suede. Plus – tool kit for piercing and eyelet setting.